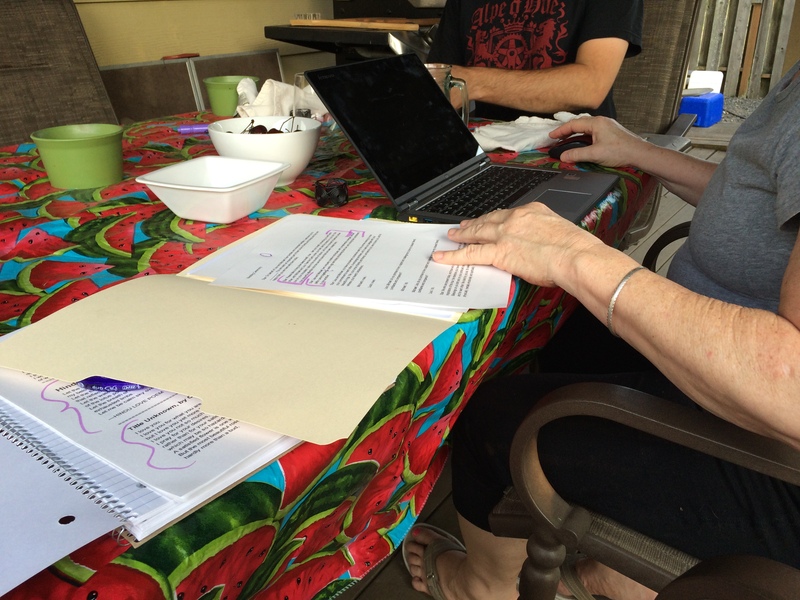 My friend Star came over for dinner and to help us write our wedding ceremony. She’s the officiant and we both have been working on the ceremony and vows for a bit now on our own. It was time to come together and make it all fit. Since she’s a vegetarian, I wanted to make a recipe that was veggie friendly and that also used up some of the zucchini from our garden. 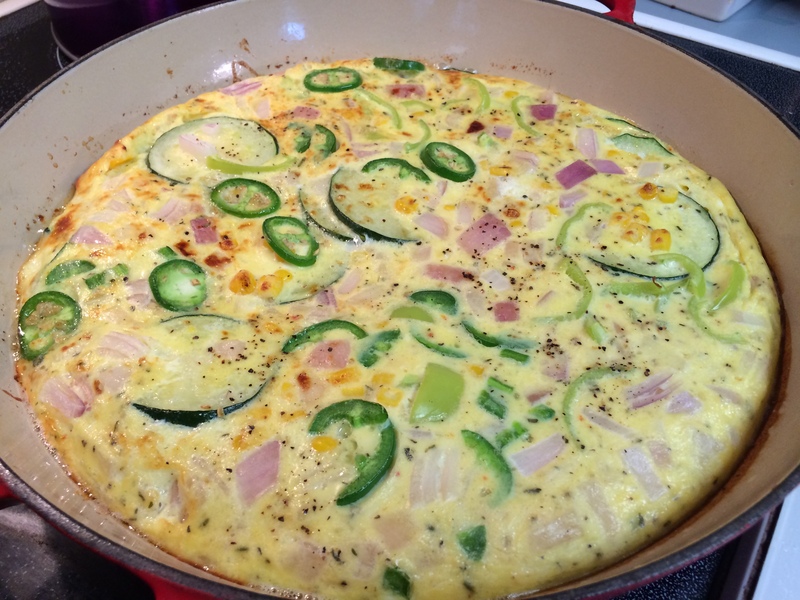 I found a few different frittata recipes and decided to make one of them. 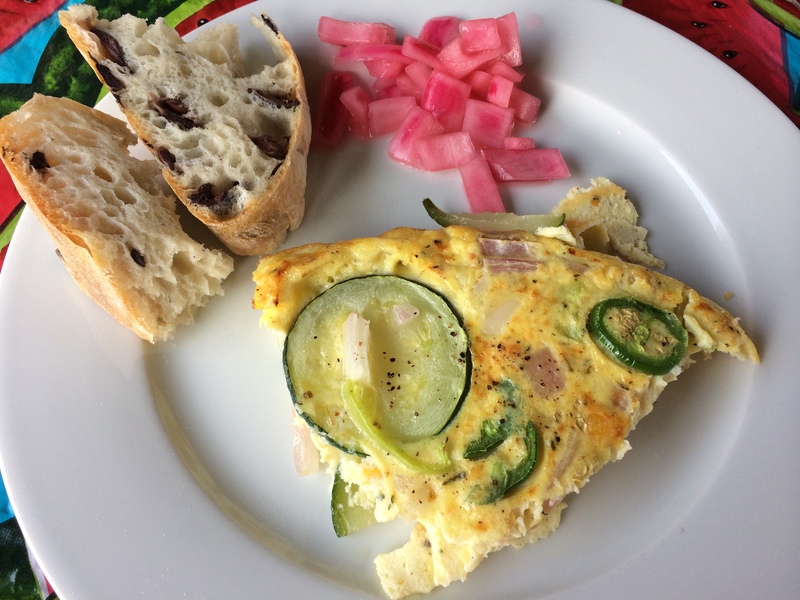 I used two different frittata recipes to make my own. I liked the spicy ingredients in this recipe, but I also liked that the other recipe called for ricotta cheese (which I needed to use up). Beat the eggs in a medium bowl. Add the ricotta and Parmesan and beat to combine. Add the salt, freshly ground black pepper, basil and thyme and beat to combine. Set aside. Heat the olive oil in a 10-inch oven-proof stick-free skillet on medium high. When the oil is hot and begins to shimmer, add the zucchini slices. Stir so that the zucchini slices are all coated with some of the oil. Cook, stirring only occasionally (if you stir too much the zucchini won't brown), until the zucchini slices are lightly browned, about 5-6 minutes. Remove from heat. Remove zucchini slices from the pan with tongs or a slotted spoon to a bowl. Let cool for 30 seconds or so, and then stir the zucchini slices to the egg mixture. Reheat the skillet. There should be a couple of tablespoons of oil left in the pan, if not, add some. When the oil is hot, pour the egg mixture into the pan. Do not stir it. Reduce the heat to medium. Let the egg mixture cook. 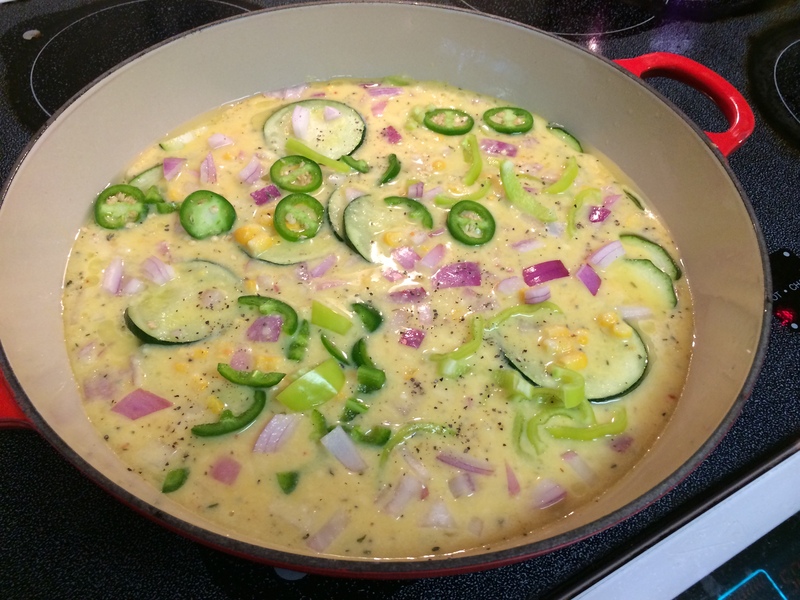 Run a spatula along the edge of the frittata, separating the cooked edges from the pan. Let the egg mixture cook until the bottom is golden brown and the top is beginning to set, about 5-6 minutes. Set the top rack 5 inches from the heating element in the oven. Preheat the oven broiler. Once the top of the frittata has started to set in the pan on the stove top, remove the pan from the stove and place it in the oven. With the broiler on, the door of the oven needs to be open. You can let the pan's handle stick out from the oven through the open door. Cook under the broiler until the top starts to become lightly browned, about 2 minutes. Alternatively, instead of using the broiler, you can place a plate face-down on top of the skillet. Flip the skillet over to release the frittata on to the plate. Then slide the frittata from the plate back on to the skillet. Let cook for a couple of minutes more until the bottom side gets browned. 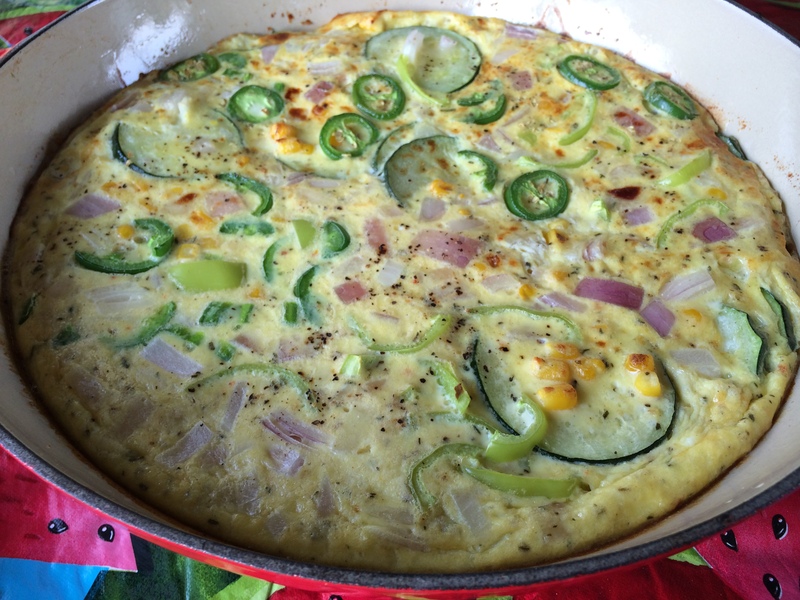 Slide the frittata out of the skillet onto a serving plate. Let cool for a minute or two and serve. The recipe called for 6 eggs and said it fed 2-3 people. I think it actually fed more like 5 people. We each had a fairly large serving and there were two more servings left over (which I had one for lunch the next day). 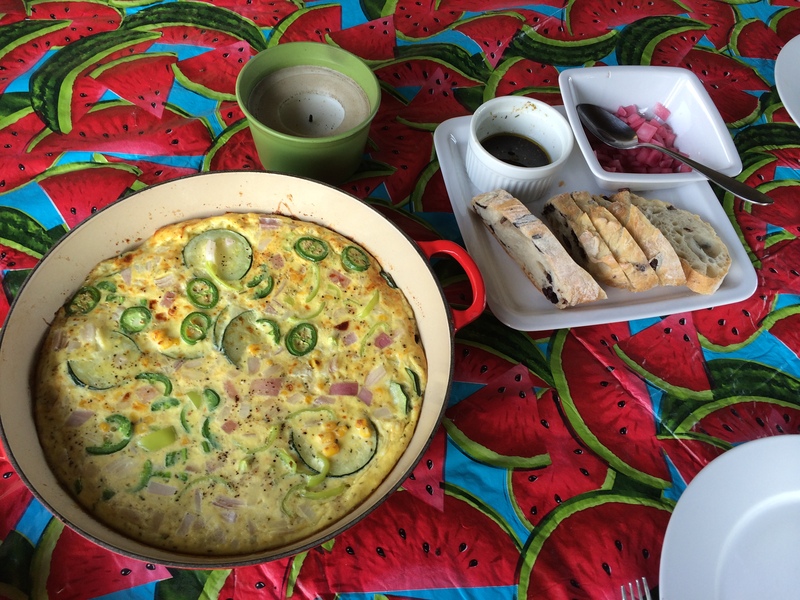 I put most of the spicy jalapenos on one side of the frittata and used the banana peppers on the other because they are less spicy and that was for Star. The recipe called for cooking the frittata on the stovetop for 5-6 minutes. I ended up cooking it for more like 10 I think. It was really jiggly and a little too wet still. This was the first time I made a frittata so I used some of Michael’s experience to figure out when it was ready to be baked. Perhaps using a cast iron skillet is why it took longer…? Who knows. We sat outside on the deck and listened to the kid’s football (or soccer) game going on in the distance. The crickets were singing nearby and the there was a lovely breeze that cooled down the hot day. I had a glass of the Trader Joe’s Coastal Sauvignon Blanc wine (it’s fabulous) with dinner and lots of water. Dinner was good but Michael and I both agreed that it needed a meat. Chorizo would have been nice. I think diced ham would be great, too. The dish would definitely be better with some salty, flavorful meat in it. Despite that, it was a decent vegetarian meal and Star loved it so that’s what counts. After dinner we worked on the ceremony. We ended up getting it done, a rough draft that still needs a little tweaking, but it’s done. One more thing to cross off the to-do list! The most beautiful rose is one hardly more than a bud wherein the pangs and ecstasies of desire are working for a larger and finer growth. On Sunday I went to yoga and then spent some time in the yard pulling weeds (god it’s been never ending this summer!). After that we went to Cartlandia for lunch. 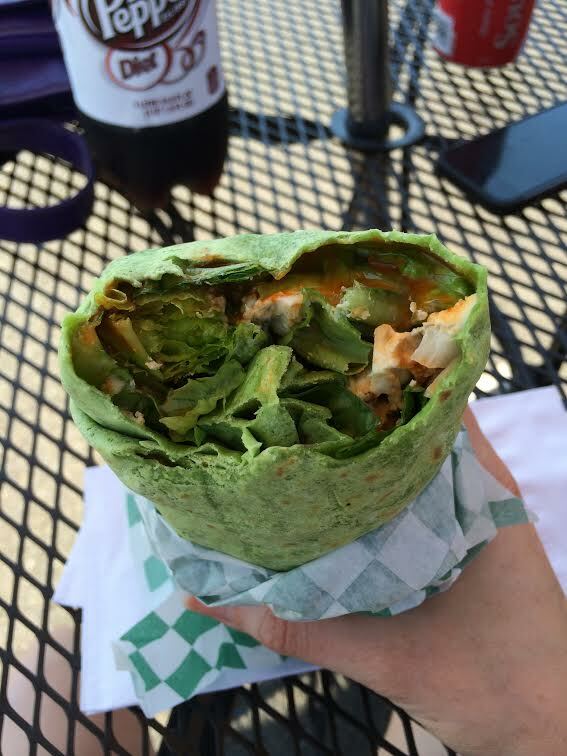 I got a buffalo chicken wrap in a spinach tortilla from the Good and Evil Wrap. I love that place and was craving it lately. SO GOOD. After lunch we had a dance lesson. The DJ we hired for the wedding also teaches dance. I brought the shoes I am going to wear for the ceremony (my grandmother’s shoes) and also my favorite pair of heels just in case. 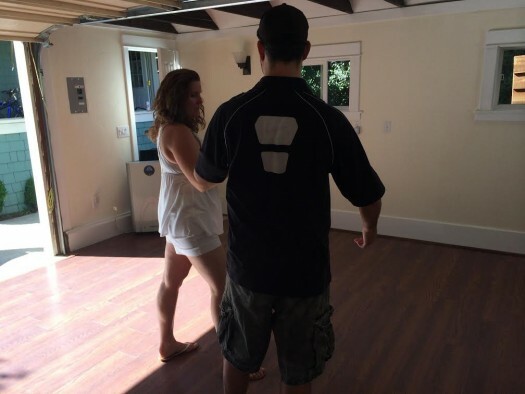 They had converted their garage into a dance studio. It was pretty nice. The private lesson was an hour and we got a discount due to hiring them for the wedding. I have some dance experience. I took ballroom dancing classes but it was over a decade ago. At that class I learned the basics of ballroom dance–tango, salsa, box step, etc. I remember it being hard and a really good workout. I was hoping some of that would come back to me once we started but…not so much. Lynn and her husband Mark taught us how to dance to our first song and showed us a few choreographed moves. It was so hard! It just didn’t come naturally like I thought it would and I felt like Michael and I were out of sync often. I also noticed that *I* try to lead too much. It’s just not in my nature to follow. LOL. We spent an hour with them and when we switched partners and I danced with Mark or even Lynn, I was impressed with how good they dance. I also noticed that I danced better with them because they were confident leaders. I think Michael and I need a LOT of practice still! Sounds like you are very prepared for the wedding! John’s father had published a small book of poetry and we had him read one of his poems at our wedding and that was very special. Aw that’s so sweet! What a nice tribute to John’s dad. Consequently tasty! That appears irresistible. Claudia recently posted..Jak dobrać dla siebie obuwie skórzane? It was great cold as a leftover too.